A cross ice conditioning game for this week. Players start off playing 1v1. When the offensive player gets a shot on goal, he/she changes with their line. Each line shoots at the net closest to their line. This creates a constant pressure situation as well as the potential for a conditioning element for one side. It is a continuous game. This game can also be done in a 1v1 situation where you add a player on a shot on goal, maximum of 2 on either team. 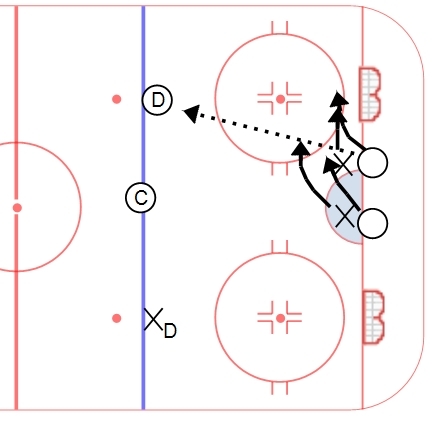 This further creates a conditioning scenario, where one player often gets stuck out on the ice defending. It becomes a change on the whistle game. 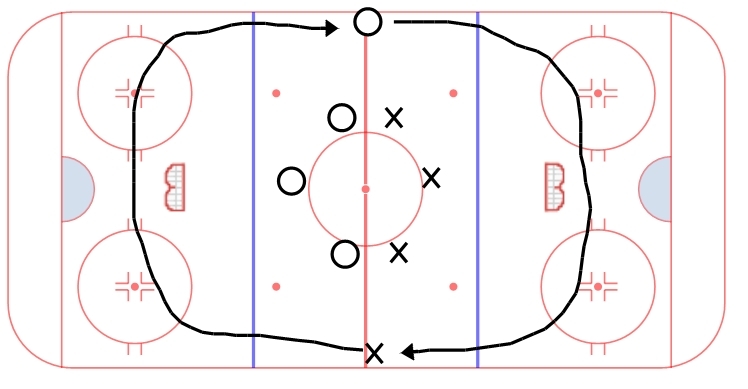 A fun 3v3 hockey sense drill. Two nets in one end, both facing the same direction. Teams can shoot at any net. You have to pass to a coach to transition from defense to offense. Coaches can pass to each other as well as be used as an outlet at any time. This game attempts to help players with their hockey sense and spacing – they need to move away from the puck and have multiple options to attack and defend. Being a man on man game, there is some deception and puck protection involved as well. A great game to use at any point in time during practice, beginning, middle or end. A simple and competitive tight area drill that is good for all players – goalies can get as much out of this as skaters. Players can play any position, for explanation the positions are marked differently. The drill is 3v3 on the circle. Only the two players in the circle can play inside of the circle, the other players have to stay on the perimeter. There is a center line that the players cannot cross (blue dashes). When the puck is in play, the X’s attack the net on the right, the O’s attack the net on the left. If the X’s have the puck, the two XF’s and the one XD are playing together in a 3v1 – the one OD is attempting to use his stick/body to defend. On possession, the OD combines with the OF’s to attack the one XD and the net on the left. The objective is puck movement and quick transition. The ability to get shots off quickly and/or make a quick back door play. Goalies are tested in their ability to compete and battle for pucks around the net and back door. This year, we tried a new concept in starting our practices with a three zone warmup at least once per week. The drills would differ, but the format would remain the same. In this example, we would start with three players stationary on each circle in one zone and have them pass (3 Man Passing). We would do variations such as backhand only, catch with forehand drag to backhand and pass, catch on backhand pull to forehand and pass, saucer passes, etc. In the middle, we had 2v1 keep away with the same three man group that did the passing. All six would skate around the neutral zone, but you would do keep away just with your three guys. In the far zone we did 3v3 cross ice. Whistle blows every 60-90 seconds to advance to the next zone, and we would work each zone anywhere from 3-5 times per group. 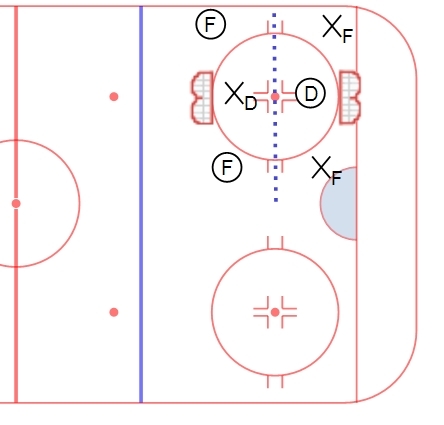 Generally, we would do a passing drill in the first zone, a skill drill in the middle and a game in the far zone. There are a number of variations that are possible in each zone – be creative! 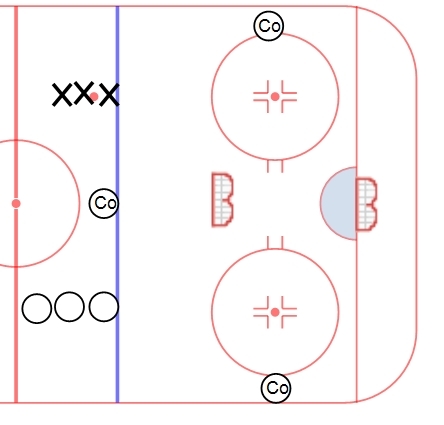 A small area game played in the neutral zone. 3 O’s vs 3 X’s play between the tops of the circles. An additional player is a “trailer” on the offensive side of the puck, being able to move anywhere along the boards or behind the net on one side of the red line. 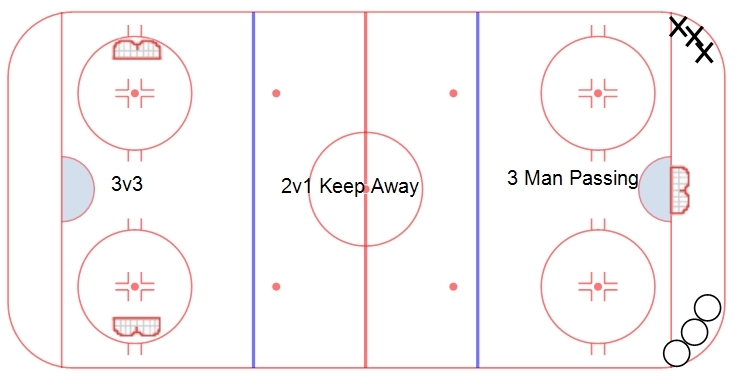 This creates a 4v3 in the offensive zone. We will put a requirement that you have to pass to the trailer. This game creates odd man situations offensively and helps players work on developing hockey sense, spatial awareness and understanding of passing lanes. A simple small area 2v2 game. Two X’s and two O’s play two on two down low. In order to score a goal, they must pass the puck to the defenseman standing at the blue line directly in front of the net they are attacking (in this example, O’s are attacking the top net, X’s are attacking the bottom net). Once the puck goes to the defenseman, the D must shoot the puck on net with the net front players looking to block/tip. After the shot, play goes live and continues in zone. As a variation, attacking plays can be allowed to move around and find passing lanes rather than simply fighting for net front postioning. This drill works on a number of tight area skills. Defensemen must shoot with their head up, looking for sticks and lanes to get pucks through. Forwards must work on gaining leverage, screening the goalie, being heavy on their sticks and fighting for rebounds. Tight area puck skills and creativity are required as well. This is a great drill for teams looking to get better at scoring dirty goals at the net front, and for defensemen who need to work on their ability to get pucks through to the cage.